A unique kit containing anatomical body parts produced by 3D printing is now available for medical students to use worldwide. The kit, developed by Monash University scientists, is the first commercially available resource of its kind. 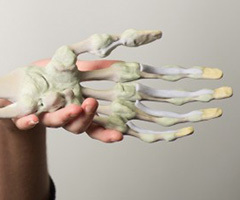 The team from Monash announced last year their 3D Printed Anatomy Series – a kit that contains no human tissue, which does however contain representative regions of the body such as limbs, chest, abdomen, head and neck that would be needed to teach human anatomy. After signing a deal with German anatomical model makers, Erler-Zimmer, the series is now available for sale online. For those wanting to read about the innovative techniques involved, Professor Paul McMenamin, Director of the University's Centre for Human Anatomy Education, and his team have published a paper titled The Production of Anatomical Teaching Resources Using Three-Dimensional (3D) Printing Technology in the journal Anatomical Sciences Education. For centuries medical students have needed to use donated human cadavers to learn anatomy as part of their preparation for dealing with patients. But preserved cadavers are not always available in many countries and plastinated bodies, made famous by Gunther von Hagens, can cost hundreds of thousands of dollars and the waiting list can be as long as two years. The deal announced today means that anyone, anywhere can buy anatomically correct, plastic 3D prints of a leg, arm or a full body – online, with delivery within weeks at the fraction of a cost of an embalmed or plastinated body. The series also includes anatomically correct models that would be impossible to visualise in an embalmed body – such as 3D prints of the vasculature of the brain, based on a CT scan, with fine, spidery veins and arteries resting nest like within that skull. Professor Paul McMenamin said the 3D prints of the entire human body had been created using the skills of the team at the Centre, using technologies such as laser hand-held scanners, MRI imaging and CT scans. "For centuries cadavers bequested to medical schools have been used to teach students about human anatomy, a practice that continues today. However many medical schools report either a shortage of cadavers, or find their handling and storage too expensive as a result of strict regulations governing where cadavers can be dissected," he said. "We believe our kit will revolutionise learning for medical students by enabling them to look inside the body and see the muscles, tendons, ligaments, and blood vessels. At the moment it can be incredibly hard for students to understand the three dimensional form of human anatomy, and we believe this kit will make a huge difference – a sort of 3D textbook if you like." Professor Paul McMenamin said the simple and cost-effective anatomical kit would dramatically improve trainee doctors' and other health professionals' knowledge and could even contribute to the development of better surgical outcomes for patients. Authorised by: Chief Marketing Officer, Strategic Marketing and Communications. Maintained by: FMNHS Web Team. Last updated: Feb 2018.